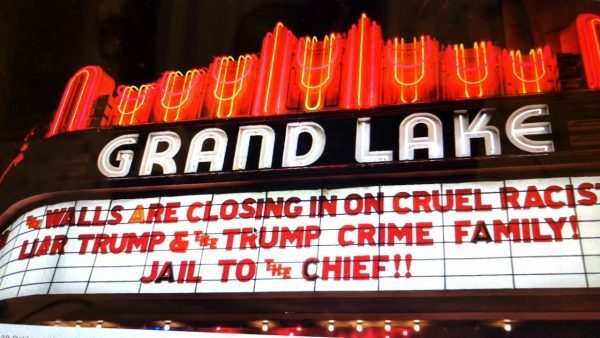 Grand Lake Theater Oakland Says “Jail To The Chief” Donald Trump. Allen Michaan, owner of The Grand Lake Theater in Oakland, sent over an email of a photo of his latest marquee message. The Grand Lake Theater is at 3200 Grand Avenue near Lake Merritt in Oakland, California. It’s the oldest movie theater on the West Coast and on the National Historic Register. Be the first to comment on "Grand Lake Theater Oakland Says “Jail To The Chief” Donald Trump – Vlog"